Newly-engineered, increased-yield rice would be allowed under updated USDA rules. Thanks to selective gene editing, scientists figured out how to grow a strain of rice with a significantly-enhanced yield without sacrificing the plant’s ability to survive. 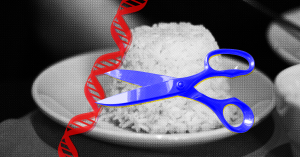 In two separate tests, the researchers found that the genetically-altered crops produced 25 percent and 31 percent more grain than a naturally-bred strain of rice. In order to create the new mutant strain of rice, horticulturalists and molecular biologists from the Chinese Academy of Sciences and Purdue University used CRISPR/Cas-9 gene editing techniques to remove specific genes known to suppress growth. They published their work in the journal Proceedings of the National Academy of Sciences (PNAS) which sometimes accepts subpar research from NAS members’ friends or lab members, but in this case the research underwent the peer review process and stood up to academic scrutiny. What remains unclear about this research is whether it will be used to help combat global hunger, which affects roughly one-ninth of the people on Earth, or if it will just lead to, you know, more rice. The next step for the researchers is to see if the same technique translates to the strains of rice that farmers actually grow. If the same boost to crop yield happens, then the mutant strains could give rise to a new abundance of food that could potentially help a lot of people in need. Whether or not it’s used to help the needy, that rice could just as readily end up on your plate. In late March, the US Department of Agriculture announced that it would not place additional regulations on plants that had been altered by selective gene editing techniques like Crispr/Cas-9 as long as those same mutations could hypothetically have occurred in nature. So while a bioluminescent rice/firefly hybrid would probably raise an eyebrow, this high-abundance rice is just fine as far as the USDA is concerned. While the researchers who found the right combination of genes to edit out argue that expecting their new strain to emerge on its own is not feasible, that’s because of the highly-specific mutations that would need to randomly occur, not because they introduced any non-rice DNA or anything like that. “It would have taken millions of plants. … This is a real accomplishment that could not have been done without CRISPR,” horticulturalist Ray Bressen of Purdue University said in a press release.